I’ve been doing this Weight Watchers thing for a long time. A long time ago, I remember my leader, MaryLou giving us a wonderful way to look at challenges. She said “View every challenge as an opportunity to succeed.” I think that should have been my motivation for last weekend. I was worried heading to WW this morning because of all the challenges last weekend…bridal shower, Rock A Hula party, engagement party. Well they were a challenge to be sure. I did my best, lived through it and today at WW I had a three-quarter of a pound weight loss!! 🙂 Am I happy? You Bet I Am!! I did my best to journal all of my food over the weekend. I journaled all of my foods during the week. I think I’ve proven to myself that I can face these challenges. I feel that this was a successful week. Friday I was a little sluggish. I felt that way on Thursday, too. I don’t know why. I didn’t accomplish much. I’ve got to get myself motivated to do what I need to do to prepare for our upcoming trip. Lots to do and lots to look forward to. More on that over the next couple of weeks. Friday was a good food day. I hadn’t made overnight oats so I went with what I had. 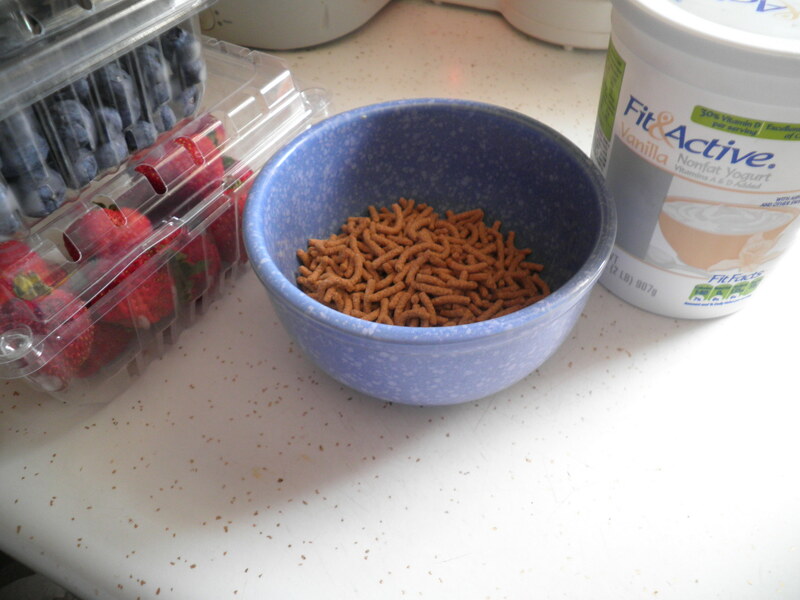 I started with a cup of Fiber One, added a cup of Aldi’s Light & Fit fat-free vanilla yogurt. It’s so tasty and so inexpensive! 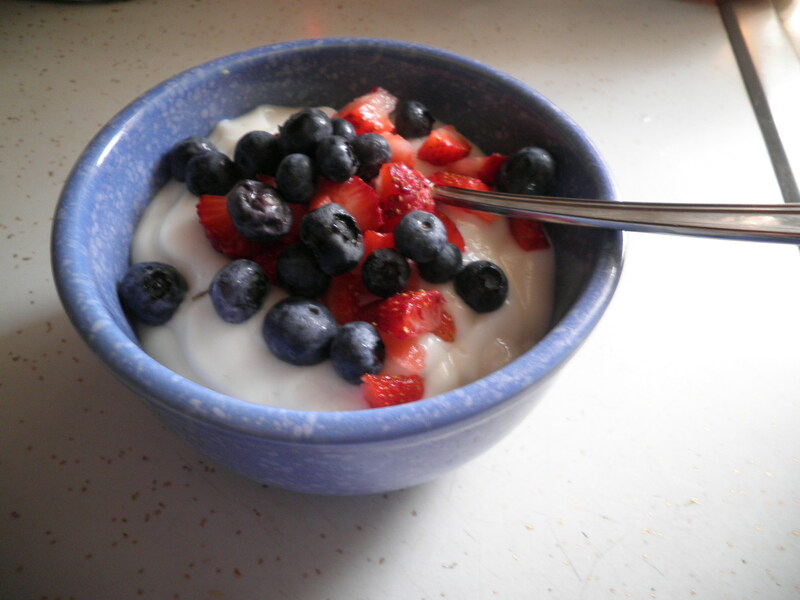 Added yummy blueberries and strawberries. So good and so filling. Ralph was out for dinner so I got to just take care of Me. 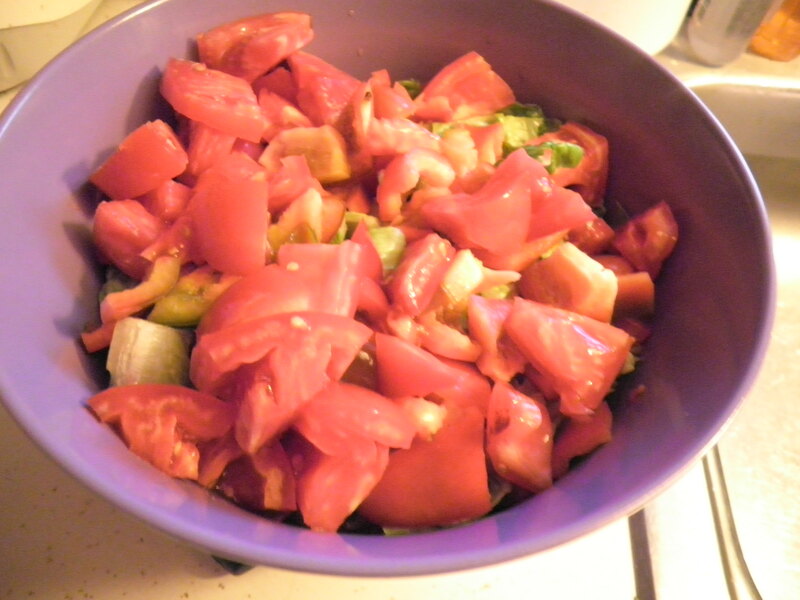 Started with my typical salad of romaine, Jersey tomato and red bell pepper. Boring, but I like it! 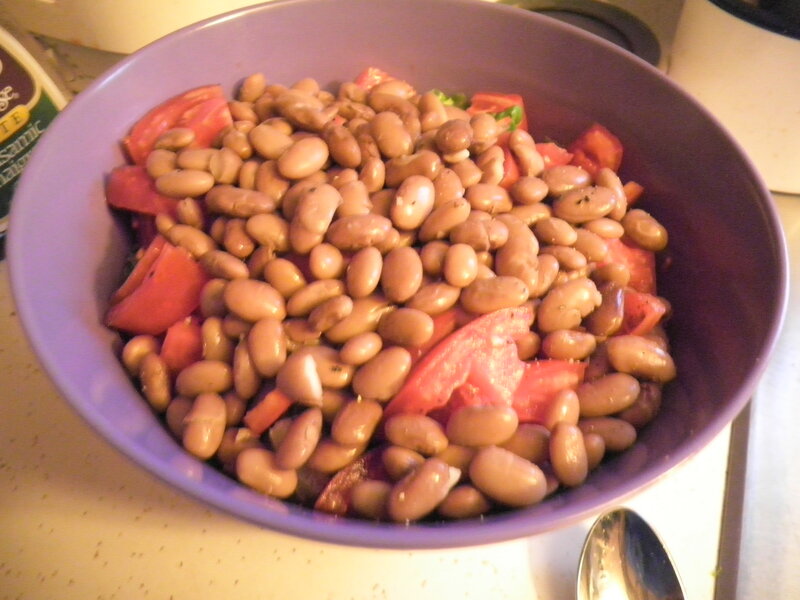 Added 1 cup of my home-made pinto beans…I’m loving them!! 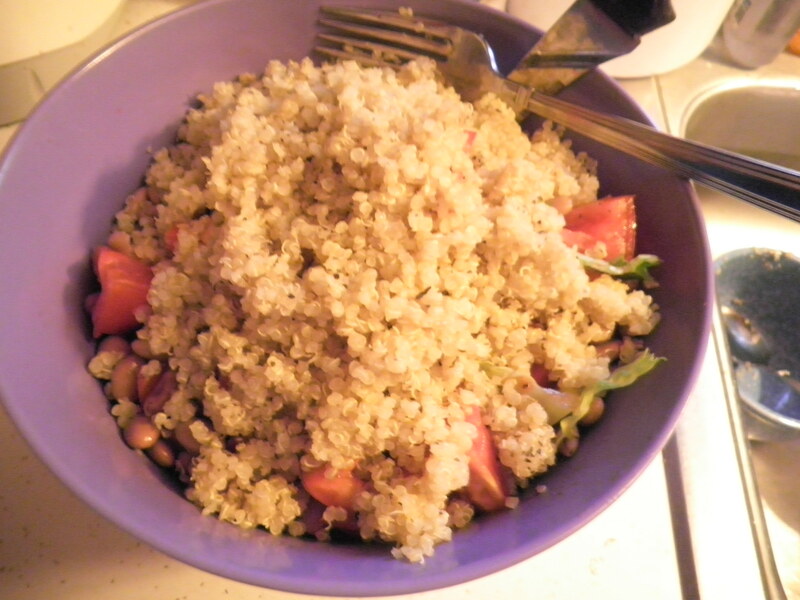 Took a cup of the quinoa I had made earlier in the week…such a good idea to make extra…just like with the beans. I added garlic powder, ground black pepper and dried basil. Microwaved for about 45 seconds to warm it up. Then added to the salad. Topped with balsamic vinaigrette. 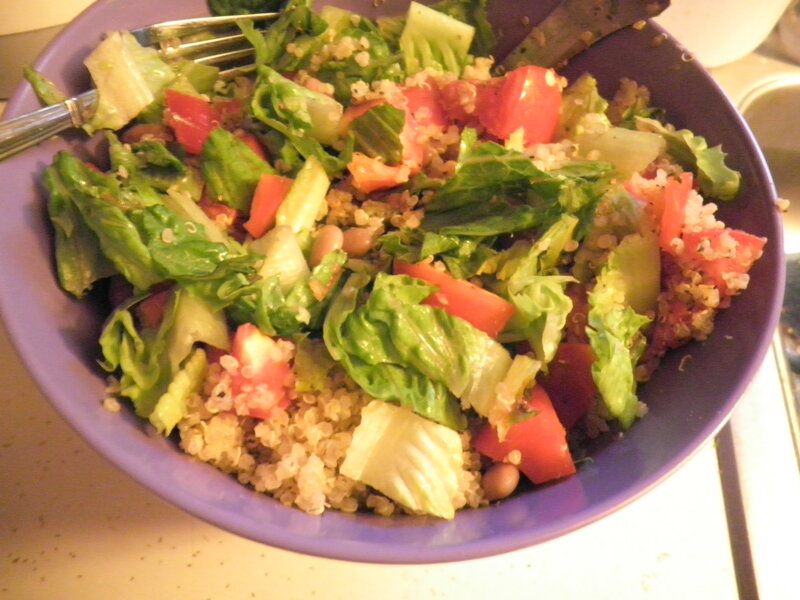 By the looks of this salad, even my Big Purple Bowl can’t contain it!! I’m not going to get a bigger bowl…just kidding! The great thing about this is, most of what’s in the bowl doesn’t count on WW (the veggies) and I’m getting lots of protein (beans and quinoa) which I need. It’s a great way to fill myself up and stay on track. And it’s good for me!! Saturday has started out positive and I hope it will stay that way. I’ve got to get myself up and doing things. I’m proud of this week. Just remember…View Every Challenge As An Opportunity To Succeed. 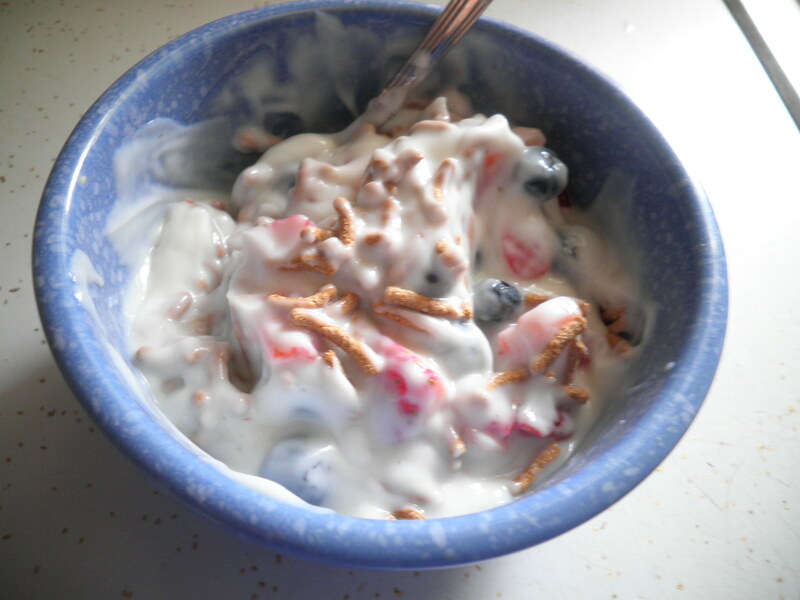 This entry was posted in Uncategorized and tagged beans, Big Purple Bowl, fruit, quinoa, Weight Watchers, yogurt. Bookmark the permalink. Just found your blog and wanted to stop in! I did WW many years ago and love it. Now, I stick more to intuitive eating and portion control! Can’t wait to snoop around a little and read your upcoming posts! Enjoy the rest of the weekend! Hi Jenn!! Thanks so much for stopping by BCDC!! I love blogging and I love WW. I was a leader for 15 years, but had to give it up due to other work committments. Would love to get back to it now that I’m not working anymore. Please, come back often. I try to have fun here. Snoop all you like! I’ll be checking out The Italian Housewife, too. Thanks!! mmm i LOVE all those beans- looks so delicious! Hi Kelsey!! Thanks for stopping by! I keep trying and it seems to be working since the beginning of the year. I actually think that the blog has helped! Thanks for loving my beans…I have a friend who complains I use too many beans. I don’t make her EAT them so she should stop complaining!! Visit often! Way to manage the challenges! You will be my inspiration for the next couple weeks: I’m halfway through the 1st one w/2 all-you-can eat buffets, and a day when I got dizzy and Mark fed me every high-calorie protein food he could get his hands on. The calorie denseness continues on Monday with 3 house guests for a week including a 14 year old boy. I weigh in on Wednesday – last week I was .2 lbs away from being free. So far this week – not so much…. You can do it Val. Remember what a plus this has been to your health, lowering your cholesterol. It’s really hard when there are other people around, but I try to remember, just because they’re eating something doesn’t mean I have to. It’s hard when it’s something you want. Keep foremost in your mind, though, the OTHER thing that you want. Improved health and a free seat! You can to it. If you can just stay the same this week, that will be a victory and then look for your loss next week. Hang in there, sweetie…you can do this! !